The LingQ forum is a great place to ask questions, get lesson ideas and meet friends. To post on the forum first click "All Forums" to see where your question or comment fits best. After clicking on the forum you will post on, click the "New Thread" button in the top left. Here you can add a title and type your comment. The Forum is very active, so you can expect a response from another member or a member of the LingQ team. Remember to be respectful of other members when posting in any forum on LingQ. The Exchange page is where you can submit writing to be checked by a LingQ member. Click the "+Submit Writing" button at the top of the page to get started. Next select the language you will write in, add a title and start typing. There is a 200 word limit. When you are done you can click "Check Spelling" and correct any errors. If everything looks good, click "Submit" and your writing will be posted on the Exchange where LingQ members can correct it for you. You can then import the corrected text as a lesson. To correct a member's writing simply click the "Correct Writing" button and type your corrections. Try to make the finished writing sound natural. It should read as if a native speaker could have written it. Clicking the My Profile tab on the Community page to see your learning statistics. 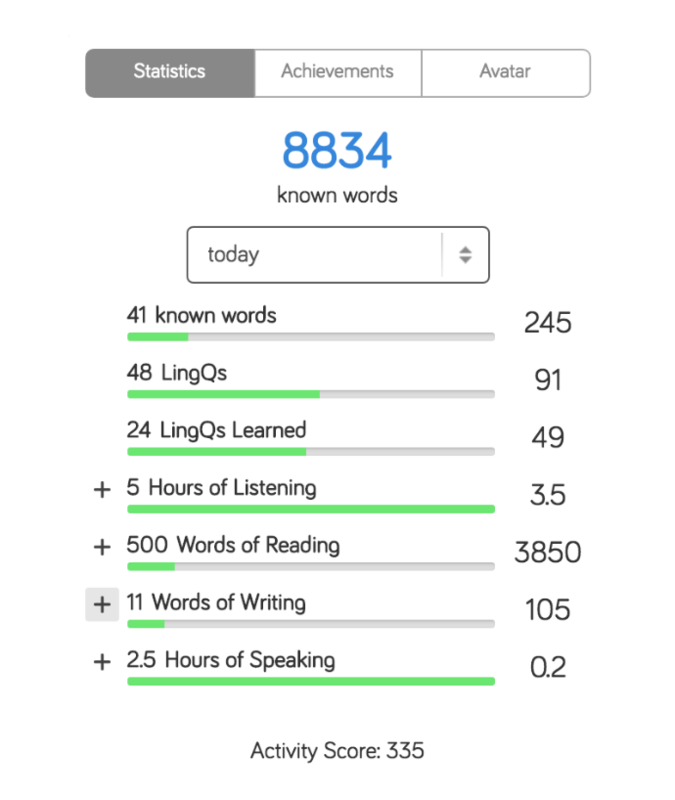 You can see metrics on all progress on LingQ: how many known words you know, the hours of listening and reading you have done, the lessons you have completed and lots more. You can change the language, learning metric and time frame by clicking the dropdowns under the My Profile text. What does the apple icon mean? The Activity Apple measures your activity on the site in the last 30 days. Your apple changes colour the more you do on LingQ. You can see how many LingQs you need to make to meet your daily LingQs goal in the big apple in your My Profile tab. Why is my Activity Score decreasing? Your Activity Score measures your activity for the last 30 days. Any activity that occurred more than 30 days ago is no longer included. How do I set my goals and targets? Your targets are set automatically by the system based on your Known Words total. As you add Known Words your level will move up and your targets will be adjusted. Can I record my learning activities away from LingQ? All your activities on LingQ are automatically recorded but you can record additional activities manually. In the My Profile tab on the Community page click the plus sign beside each activity you want to record. These statistics will be added to your totals. Note that you can input negative numbers to subtract from your totals. How do I find friends to follow? There are a number of reasons to Follow someone on LingQ. You might follow members studying the same language as you to compare progress, or members who study or create interesting lessons for example. Following a member is easy. Just click their username and you will be take to their profile. There you will see a "Follow" button next to the member’s username. One click and you are following. You can also find members to follow if you know their username. Simply enter the username in the "Search Users" text field in the top right of the Forum tab, enter the username and click “Follow” when you get to their profile.